One thing that’s nearly certain is the presence of extreme-right populist Marine Le Pen among the top vote-getters. Her party, the Front National (FN), has gone from a pariah in the 1980s to a major political force. While she and her father, Jean-Marie Le Pen, have fallen short up to now, what would happen if she won in 2017? The answer can perhaps be found in – of all places – a graphic-novel series. Created by writer François Durpaire and artist Farid Boudjellal, the first volume, “La Présidente”, was the hit of the 2015 rentrée (the beginning of the literary season). It was followed by the second volume, “Totalitaire” in 2016, and together they have sold more than 500,000 copies. Now comes the third volume, titled “La Vague” (“The Wave”), with Durpaire and Boudjellal joined by Laurent Muller. Together the three books provide an enlightening view on the collective anxiety of French citizens as they face a 2017 presidential election whose outcome has never been less certain, and whose consequences for the country and Europe could be profound. The 2017 presidential campaign in France has been full of surprises, from François Hollande’s decision not to run for a second term to former prime minister Manuel Valls getting defeated in the Socialist Party primary; from the rise of insider-outsider Emmanuel Macron to the standout debate performance by far-left candidate Philippe Poutou; from François Fillon’s rise, fall, and rise to Jean-Luc Mélenchon’s last-minute surge. All the twists and turns have increased the uncertainty of an election that was up in the air from the start. One thing that’s nearly certain is the presence of extreme-right populist Marine Le Pen among the top vote-getters. Her party, the Front National (FN), has gone from a pariah in the 1980s to a major political force. While she and her father, Jean-Marie Le Pen, have fallen short up to now, what would happen if she won in 2017? The answer can perhaps be found in – of all places – a graphic-novel series. 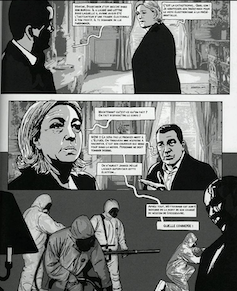 Created by writer François Durpaire and artist Farid Boudjellal, the first volume, “La Présidente”, was the hit of the 2015 rentrée (the beginning of the literary season). 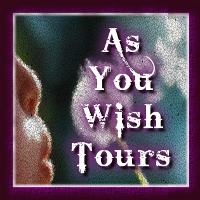 It was followed by the second volume, “Totalitaire” in 2016, and together they have sold more than 500,000 copies. Now comes the third volume, titled “La Vague” (“The Wave”), with Durpaire and Boudjellal joined by Laurent Muller. Together the three books provide an enlightening view on the collective anxiety of French citizens as they face a 2017 presidential election whose outcome has never been less certain, and whose consequences for the country and Europe could be profound. Durpaire, Muller and Boudjellal are well-versed in the mechanisms of power within the FN and have a superb knowledge of the media and political machinations in France. 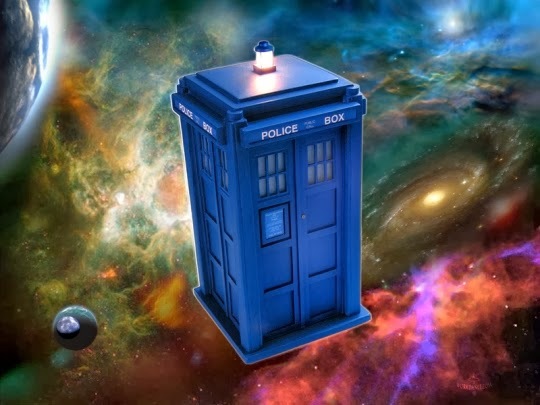 The originality of the series – a sort of retelling of the near future – is to apply a historical methodology and then to put the imagination into action. In the first volume, the authors imagine that on May 7, 2017, Marine Le Pen is elected president of the French Republic. 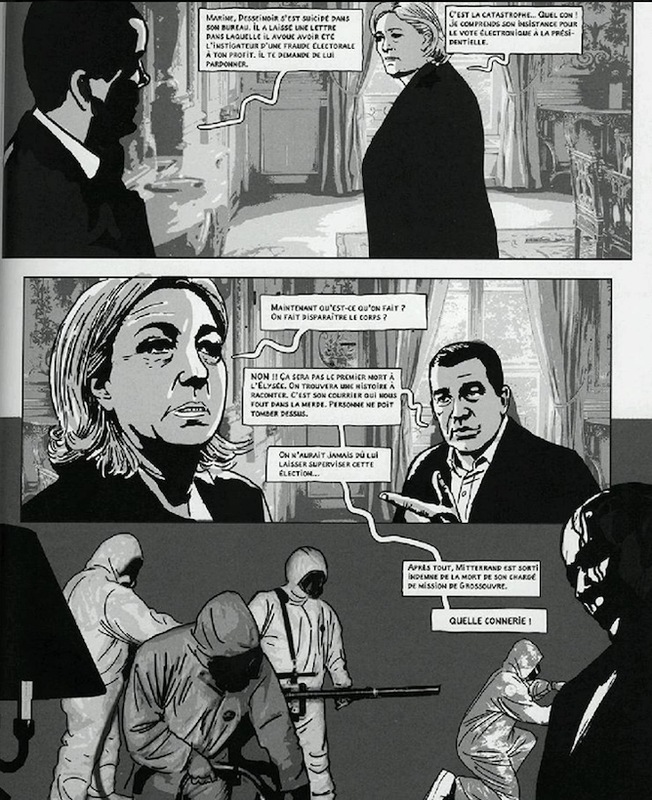 Boudjellal’s sharply realistic graphic treatment and Durpaire’s insightful text allow the potential consequences of this election to unfold step by step. What seemed politically unimaginable in the second round of the 2002 presidential election – when Jean-Marie Le Pen was soundly beaten by Jacques Chirac – is today only too possible. Every voter has to think about it and to do so, it’s essential to better understand what would happen if she were to win. The narrative is not a caricature: it applies to the letter the proposed programme of the FN, with direct extracts from official communications. 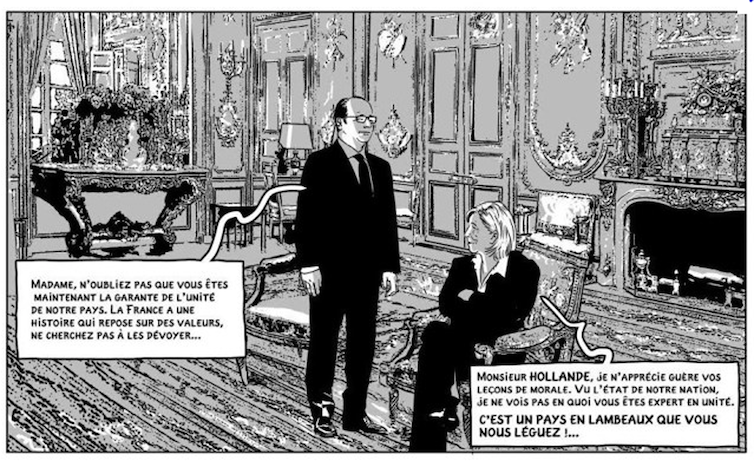 “La Présidente” describes the first hundred days of Marine Le Pen at the Elysée palace, mobilising the political machinery and methods that the FN has employed through its history. The fiction was nourished by the advice of a team of political and economic experts, who make it possible to realistically explore the possible consequences of the FN’s taking power. The graphic novel also extrapolates security propositions and technical advances already in place. In November 2015, former president Nicolas Sarkozy proposed electronic bracelets and house arrest for “S file” suspects, suspected of radicalisation, and in April 2016, Francois Hollande authorised the use of facial-recognition software. France itself is still under an extended state of emergency after the November 2015 terrorist attacks – one that will last at least through the upcoming elections. And so we see it all unfold in the graphic novels: France’s exit from the euro, mass deportations, legal preference for French citizens and widespread surveillance through new electronic and digital tools. And if the Front National wins again? In volume 2, “Totalitaire,” we’re at the end of Marine Le Pen’s first term in office, in 2022. When the new campaign opens, a surprise candidate emerges from civil society around whom resistance begins to organise. The new candidate is polling higher than the current president, but is a fair election even a possibility? And what of Marion Maréchal–Le Pen, niece of Marine Le Pen and a political power in her own right? By this point, technology offers an unprecedented capacity for monitoring and control – integrated chips in connected objects, robots, geolocation, and automated surveillance of all communications. We are far beyond Orwell’s “1984”, and the idea of France as a totalitarian country isn’t so far-fetched. In a televised debate with former prime minister Manuel Valls in 2022, portrayed in the graphic novel, Marine Le Pen says: “You speak to me of responsibility, you who were in favour of passing laws. Me, I apply them.” The events then accelerate on a global scale, with a new US president and dizzying range of geopolitical consequences. In Paris, Berlin and Madrid, new alignments emerge, even as the French president oversees the education of “a new citizen”. And when the time comes for the election, darkness wins again: the surprise candidate is imprisoned and Marion Maréchal–Le Pen is elected president after a single term by Marine Le Pen. The third volume, “La Vague”, released at the end of March, unleashes a scenario worthy of the darkest thrillers. At this point, France will have struggled through two five-year terms under the FN. There is resistance, but also unquestioning support. 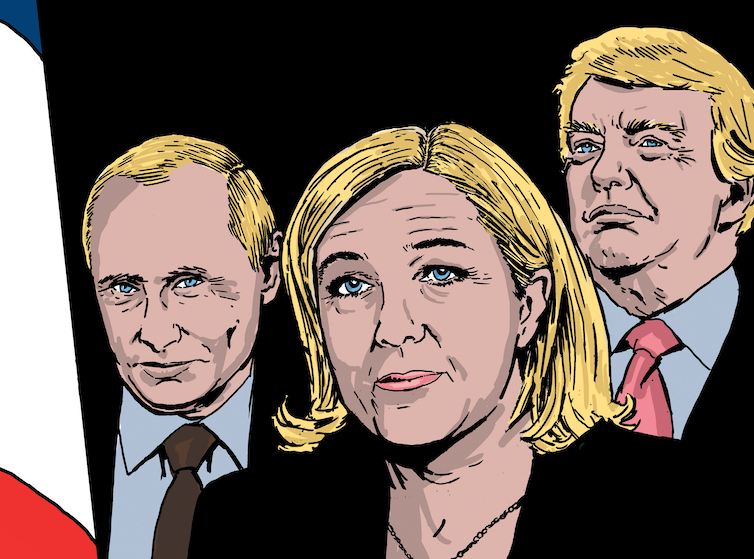 With an alliance between Donald Trump, Vladimir Putin and Le Pen, is there any chance that democracy can make a comeback? One way to read this science-fiction graphic novel is as an explicit criticism of the totalitarianism that could result were the FN to take power in May 2017 and the rise of nationalist politicians around the world. It also announces the end of a generation of leaders that has governed in a short-sighted way, as well as – and this is the reading I choose – the failure of a system where insiders reserve all the power and benefits for themselves, while leaving no place for the civility and mutual respect that are the very foundation of politics. 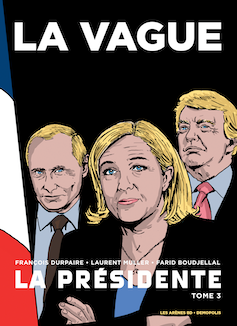 “La Vague”, “La Présidente” and “Totalitaire” are published by Les Arènes, Paris, France.